Creating Safe Environments for LGBT Students is a comprehensive training guidebook for educators who are committed to diversity and the full inclusion of LGBT students in every aspect of the Catholic high school experience. Based on five years of pilot testing in Catholic schools, this unique book emphasizes safe-staff training in integrating the Church's pastoral, social, and moral dimensions with the special needs of LGBT students. The book presents strategies and resources for building safer schools, helpful materials for communicating with parents, and general guidelines for developing and maintaining professional helping relationships with LGBT students. Based on a “training the trainer” model, Creating Safe Environments for LGBT Students encourages the development of grassroots leadership within the school. This unique book promotes a positive framework for navigating the challenging landscape of the Catholic tradition and the LGBT experience as it helps to establish anti-harassment and anti-bullying protocols for school environments and models for developing LGBT student support groups and gay/straight student alliances. The book promotes role-play by students, alumni, teachers, and parents—a hallmark of the ministry work and training methods of the Catholic Pastoral Committee on Sexual Minorities—and is flexible enough to allow each school's individual climate and culture to be respected. 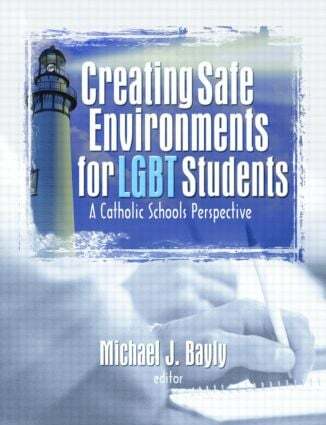 * and much more!Creating Safe Environments for LGBT Students is an essential resource for faculty and staff members at Catholic high schools, particularly school administrators, chaplains, campus ministers, psychologists, social workers, and counselors.